Our Panama Fishing Charters Boat selection gives us fast and reliable access to the Gulf of Chiriquí’s most famous big game fishing areas, such as Isla Montuosa and Hannibal Bank. 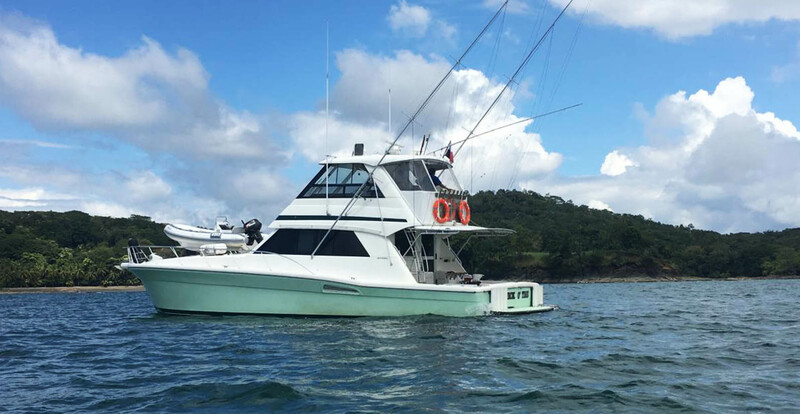 Our Sport Fishing Boat selection can accommodate any budget, offering excellent opportunities for Panama offshore fishing as well as hourly hire for inshore fishing trips. The continental shelf area has contributed to many IGFA world records and is famous for the sheer size of its fish. A particular ocean current phenomenon and has made it one of the world’s most unique fishing grounds. Whether you’re looking to Panama for offshore fishing or inshore fishing, Cala Mia offers the best Panama fishing charters in the area. Fishing Equipment: Outriggers, tuna tubes, live-bait tank. Fishing Equipment: Inshore Fishing and Dive Boat. Fuel Capacity 2,000 gals diesel and 2,000 fuel.